Many businesses have a limited understanding of Search Engine Optimising (SEO) and to a large extent the term has been misrepresented by organisation selling paid online advertising. There is lots of false information about page rankings and many SEO service providers overlook the need to understand the business and its potential market. In other words, buyer beware! This BLOG addresses four key SEO topics. Since the popularity of the internet in the 1990's the number of business web sites has grown exponentially. In the early 90's my first business website listed in the low thousands but now there are over 644,000,000 active websites world wide. Early search engines at the time ranked results by counting how many times the search terms appeared on the page or in the Meta Keywords. In the late 1990's Google appeared as an improved and more sophisticated search engine producing more relevant search results. While Google and other search engines use hundreds of rules to determine the ranking of your website for an enter search phrase, three principal strategies are used to rank your web pages by Google. How well your web page matches what someone is searching for. Google also builds a profile about your business using your website and business listings. This information is also used match your business with the searchers profile. Google considers the location of your business and the location term used in a search. If no location is specified in a search, Google calculates the distance based on what they know about your location and the person doing the search. This describes how well-known or prominent your business is. To a large extent it's based on the number of web links, articles, social media posts, directories and the number of times your web site is visited. No SEO can guarantee you top listing. Many factors contribute to your page being ranked and listed. Google along with other search engines use algorithms to index your page and these algorithms are not made public. Google makes public announcements about general changes to their algorithms in an attempt to improve search results and to level the playing field. Online advertising such as AdWords have no direct impact on your organic or natural ranking in the search results. This means, non AdWord listings will list as normal. If you are being told by a SEO services provider that it will improve your ranking, you need to question this statement. It may play an overall role in lifting your prominence through some marketing strategy but not directly. Beware of the SEO's that simply want's to sell you AdWords to improve your ranking. This shouldn't come as a surprise, after all you found this web page and you are reading it. When you go looking for a product or a service to purchase you have most likely used a search engine to locate the required solution. Larger businesses carryout SEO as a major source of quality leads generation. This can be many times higher then using outbound online promotions (Eg AdWords) to create leads. What’s more, users tend to ignore paid ad listings and click on organic results instead. When hiring a good SEO provider you should be paying for the expertise and physical execution of complex tasks. A good SEO is an extension to your marketing consultant and the cost can be quickly offset by the extra business you gain from being found more frequently and for the correct reasons. Researching your industry, market and sales trends. Finding keyword terms that can bring the most relevant traffic. You need some form of SEO these days. Gone are the days of just having a web site unless you want your website to be invisible. However, that's not why we invest in business websites. Not optimising your site for search engines means that you’re missing out on possibly one of the biggest opportunity to grow your business. What's even worse, you’re giving the business away to your competition. PPC is faster but costly. It's true. Pay-per-click (PPC) online advertisements can bring instant results. Your site can start receiving visitors almost the minute you launch your campaign. SEO builds your website’s presence before you see the results but creates continuous results without increasing cost. PPC requires constant investment and you pay every time someone clicks on your ad and the Cost-per-click increases over time as the bidding system create more competitors. When seeing clients, seeking to improve their online business presence, we reinforce the importance of getting their house in order first. Your page MDT should include keywords and be written to markets the contents of the page. Make it unique. If you don’t, you will most likely confuse Google in knowing which page to show so none will be shown. The MDT should also be relevant to the content of the page. Meta Keyword Tags are certainly not used by Google to list your site. As outlined at the start of this Blog, Google identified Keywords as a means to mislead searchers. Some other search engines may still used keywords, however this is becoming less the case. See video for further details. Meta Description Tag show in listing and search words are shown in bold. Map listing and break out panel with business details as past part of Google My Business listing. Your website should tell a story. For example, 6 unique product pages should be placed under a page named "products". This assist Google to read your web site as a book with multi descriptive URL's . Eg YourDomainName.com.au/products/banking_for_small_business. Now Google knows you have products and this particular page is about banking and small business. Page names should reflect the page content. "Contact Us" should be named "contact_us". Blogs and News pages should have longer descriptive names. Eg. "3_top_banking_tips_for_small_business_in_the_adelaide_hills"
The longer and more descriptive the page URL, means the search engines can identify with the page content and why someone has clicked on the link. Eg from Facebook. Our Table Talk "The Line Of google" Explain this in more detail. Ensure your business information is correct and consistent on all business listings. If you have changed your address or opening times, ensure all of your business listings contain the same information. Ensure each of your pages include keywords that may be used in searches. Don't just rattle a list of keywords on the page, keywords must form part of a normal sentence with substance. Good copy (wording) is important. Don't write about you or your business, rather write copy that will interest your visitors. Eg. replace "We sell deadlocks" with "Protect your home with a secure Deadlock. Your website will list more frequently when people enter a search based on their needs Eg. "Home security"
These are three really good Google SEO tools that are provided at no cost. They are Google Analytics, Webmaster Tools, Google My Business. Google Analytics is not a web site hit counter attached to your website or simple statistics counter. It's much more than that. It provides a comprehensive in-depth look at the traffic and the visitors to your website. 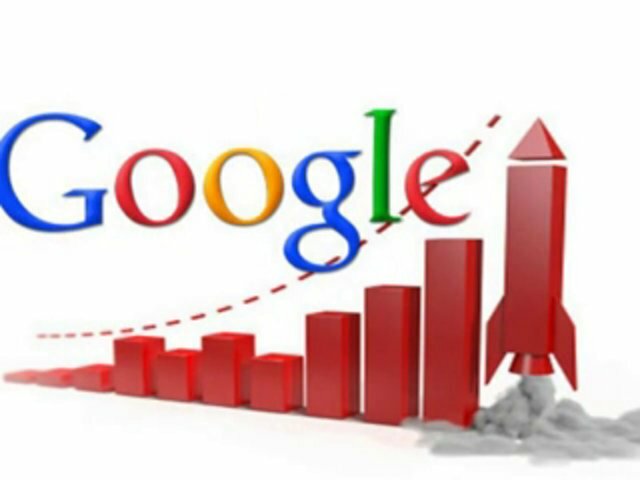 For many starting with Google Analytics, it will show you the total number of visitors to a page, the unique visitors, page views, the time people are on a webpage, the bounce rate (People leaving soon after arriving) and much more. You can review the performance or interaction with your site over set periods revealing the effects of changes such as adding keywords to page content. To establish Google Analytics, you first need to create a profile for your website. Once established, Analytics provides an HTML code or ID code to be inserted into your website. Depending on your website platform you may need to add this code to each page. This code simply invites Google Analytics to execute when people visit your page and gather visitor's non-specific information. Google Analytics is a trade-off, in that Google want to gather data associated with your site visits for marketing and profiling and in return, you get to see the information collected. Once you have connected your website to Google Analytics, have an explore. Google Webmaster improves and optimises websites by providing a clearer picture of exactly what is going on within a website. While this may seem similar to Google Analytics there are distinct differences between them. Webmaster provides a set of tools to reveal how your website is seen by Google's search engine. The "Crawl" section indicates pages that search engines will not be able to crawl and index due to an error. A web site with too many errors will certainly reduce its ranking. Webmaster also provides you with the ability to tell Google not to index private pages. "Search Results" provide insights into how many times a page was shown, the number of click-through, average listing position and more. This is essential SEO information if changes are requires or improving. The "Links" section reveals broken links on your web site. These links can either be fixed or removed. Links also reveal the number of internal links each page owns for Google to identify pages of higher importance. "Submitting a sitemap" (List of pages) for your site is a good way to ensure all of the pages your website are indexed by Google. While Google will normally find most pages to index, it's the pages that are not linked that will not be index. If you have pages that are not indexed, then they won't be found in a search. Mobile Usability was recently introduced by Google med 2015 as mobile searches reached a critical level. This Webmaster tool allows you to check the mobility of your site and how to address issues. If your site is not mobile usable, Google will not list your site to mobile devices. One tool we like to use is Data Highlighter. This tool enables you to select a typical page such as a product and inform google the structure of the page. Eg. Description, Price, Image and the like. Then Webmaster will look for other pages and update your page listings with enhance search data. Webmaster Tools will even notify you if your website becomes infected with malware. This allows you to address any issues quickly before your website is blocked by Google and other search engines. While Google My Business (GMB) is not directly a SEO tool, GMB can certainly helps you to put your business information on Google Search, Maps and Google+ so your potential customers can find you. If you previously used Google Places for Business or Google+ Pages Dashboard to manage your business information, your account has been automatically upgraded to Google My Business. GMB allows you to profile your business with Google particularly around your business location or the areas in which you service your customers. On registering with Google My Business, you will need to provide a real address for Google to verify that the address and you coexist. (PO Boxes are not acceptable) For those that work from home, you may not want your home address made public. On verifying your account you can elect to show your business address or the areas that you service. 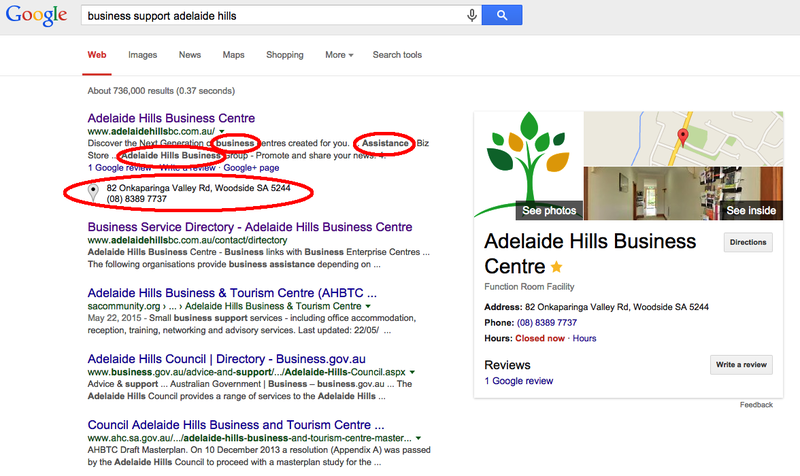 The Adelaide Hills Business Centre offers it's client to register their business location at the centre. Click here to read more. When you configure your business territory, remember the larger the area the greater chance will show more of your competitors. If most of your business come from with in 15km of you, then set that as your target range. 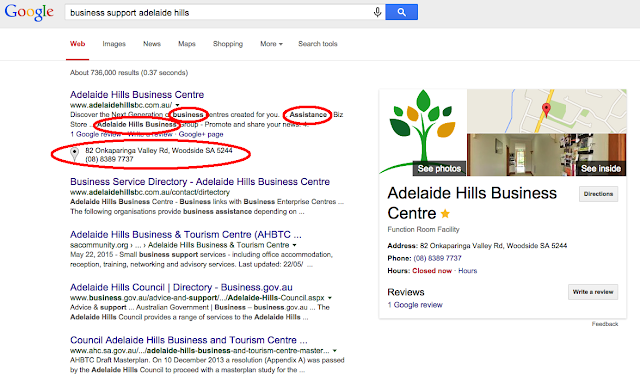 The Adelaide Hills Business Centre can assist you in establishing your Google SEO tools and you are very welcome to join one of our Table Talk topics on Google SEO tools.